Video credit as tagged - Screen cap by My Music Radar! They have never been better together. it shows in this lovely performance. Disclaimer: Copyright infringement not intended. [Fan Account] 120825 MBC Music Core - BoA & Taemin "Only One"
Up next, it was the official recording. While Taemin was standing at the side waiting for his part, he sang and danced along with BoA. (The dance) was so charismatic, not pretentious at all (S/N : Awkward phrasing), it's no wonder Taemin danced willingly/took the initiative. Today is Boa's 12th Anniversary since debut, so everyone cheered and supported her with all their might. Seems like BoA also received a video footage of the fan's support (?) and cheers so she danced adorably. Lastly, I still want to congratulate BoA a Happy 12th Anniversary! She really deserves everyone's love - OFFSTAGE, she has a adorable, animated 4-D, dorky (personality), but ONSTAGE, she is the charismatic, captivating Kwon BoA. [Fan Account 2] 120825 MBC Music Core - BoA & Taemin "Only One"
Red Checkered Shirt Taemin is as charismatic and charming as usual. Just by watching him touch his nose before he dance, I wondered if there are any changes (to the feel of) this couple dance - Seemingly Taemin discovered the blur and cute side of Queen BoA (Appendix 1 : see below), so Taemin inner-mischievious Kindergarten boy (personality) starts to unfold on the stage. By touching his nose to act cool then slowly reach out his hands to toss BoA's hair while looking at her with an evil smirk - he (gradually) starts to fool around more. I think that Taemin came for the recording with an empty stomach : During the first rehearsal, the action where Taemin had to get up from his lying down position, he slightly wobbled and smiled out of embarassment. When Taemin lay down (on the floor), it was a pity that I did not manage to catch a glimpse of what colour the band of his underwear. After he walked down the stage, he stood at the side of the performance stage in the dark. The staff members gave him water to drink. He drank a huge mouthful of water and smiled/laughed as he was being fanned while engaging in small talk with other (staff members/dancers etc). For the actual recording, the entire set of movements have been executed very smoothly. This time round the smirk on his face when he clutched on BoA's hair was not as evil/does not look as mischievous as the previous time. He touched his nose as he retreated backstage. Then he squatted at a dark corner of the performance stage again, (trying down) to lower his profile/ hide his presence. After BoA completed the entire song, he jumped back on the stage for a closing bow. BoA patted both of his shoulders from the back and then they bowed together. Today is BoA's 12th Anniversary since Debut. After Music Core live broadcast has ended, BoA held a small fan-meeting. 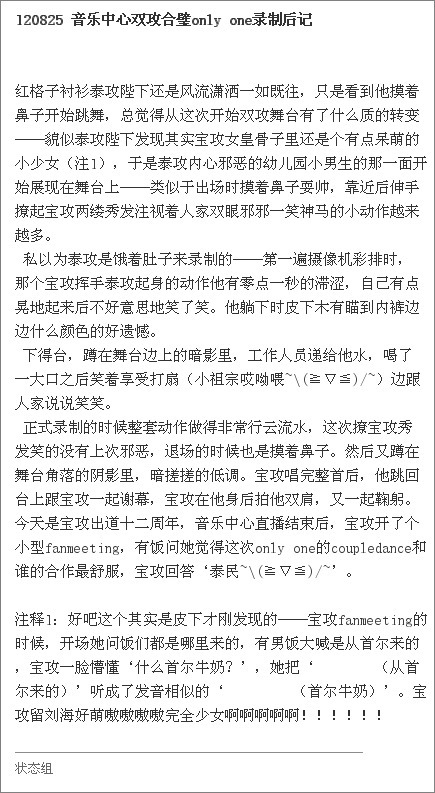 Fans asked her which partner for "Only One" Couple Dance she felt most comfortable with, and BoA answered "Taemin~"
--- Appendix 1 : During the start of the fanmeeting, she asked fans where did they come from. A fanboy shouted that he came from Seoul, BoA then gave a blur look "What Seoul Milk?" She misheard "From Seoul" as "Seoul Milk" as their pronounciation was similar.